Your day-by-day itinerary now includes Emperors Palace as well as Spas. You'll find plenty of places to visit near Johannesburg: Brits (Ukutula Lion Park & Ann van Dyk Cheetah Centre), Pretoria (Pretoria National Botanical Garden, Union Buildings, & more) and Krugersdorp (Rhino and Lion Nature Reserve & Coronation Park). Spend the 2nd (Tue) spotting exotic species with a safari tour. Spend the 14th (Sun) wandering through the wild on a nature and wildlife tour. Next up on the itinerary: see the interesting displays at Apartheid Museum, tour the pleasant surroundings at The Cradle of Humankind, try to win big at Montecasino, and contemplate the long history of Mandela House. To see more things to do, maps, traveler tips, and other tourist information, refer to the Johannesburg holiday planning tool . If you are flying in from India, the closest major airports are OR Tambo International Airport and Pilanesberg International Airport. In April, daytime highs in Johannesburg are 28°C, while nighttime lows are 14°C. 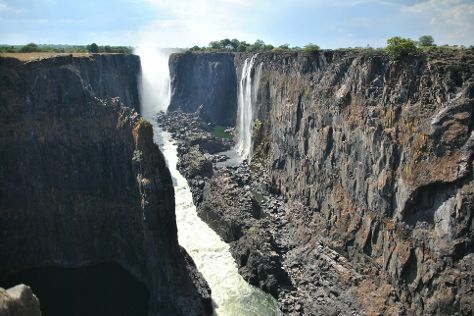 Finish your sightseeing early on the 17th (Wed) to allow enough time to travel to Victoria Falls. Kick off your visit on the 18th (Thu): take in the views from Victoria Falls Bridge, then admire the sheer force of Mosi-oa-Tunya / Victoria Falls National Park, and then push the limits with an extreme tour. Get ready for a full day of sightseeing on the next day: see exotic creatures in open habitats at a safari tour. For ratings, traveler tips, photos, and tourist information, use the Victoria Falls road trip tool . You can fly from Johannesburg to Victoria Falls in 3 hours. Other options are to do a combination of flight and car; or drive. Plan for somewhat warmer temperatures traveling from Johannesburg in April, with highs in Victoria Falls at 32°C and lows at 18°C. Wrap up your sightseeing by early afternoon on the 20th (Sat) to allow time for travel to Nairobi. Start off your visit on the 21st (Sun): delve into the distant past at Medinet Habu, then pause for some photo ops at Temple of Hatshepsut at Deir el Bahari, then explore the ancient world of Valley of the Kings, and finally explore the ancient world of Tomb of King Tutankhamun (Tut). Get ready for a full day of sightseeing on the next day: delve into the distant past at Colossi of Memnon, then delve into the distant past at Luxor Temple, then get engrossed in the history at Luxor Museum, and finally explore the ancient world of Temple of Karnak. 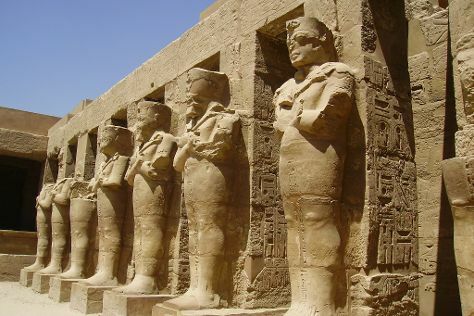 Plan a trip to Luxor easily and quickly by telling Inspirock to suggest an itinerary. Getting from Victoria Falls to Luxor by combination of car and flight takes about 14.5 hours. Other options: drive. When traveling from Victoria Falls in April, plan for somewhat warmer days and about the same nights in Luxor: temperatures range from 41°C by day to 21°C at night. Finish your sightseeing early on the 23rd (Tue) to allow enough time to travel to Nairobi. Start off your visit on the 24th (Wed): stroll through Giraffe Centre, then examine the collection at Karen Blixen Museum, then stroll through David Sheldrick Wildlife Trust, and finally explore and take pictures at Mugie Ranch. Get ready for a full day of sightseeing on the next day: look for all kinds of wild species at Wildlife Areas. To find other places to visit, where to stay, traveler tips, and other tourist information, use the Nairobi vacation planner . You can fly from Luxor to Nairobi in 13 hours. Alternatively, you can drive. Traveling from Luxor to Nairobi, you'll lose 1 hour due to the time zone difference. When traveling from Luxor in April, plan for a bit cooler days in Nairobi, with highs around 30°C, while nights are about the same with lows around 20°C. Finish your sightseeing early on the 25th (Thu) to allow enough time to travel to Praslin Island. On the 26th (Fri), stroll through Vallee de Mai Nature Reserve and then head off the coast to Curieuse Island. On your second day here, kick back and relax at Anse Lazio, enjoy the sand and surf at Anse Volbert, and then view the masterpieces at Galerie Passerose. For reviews, ratings, and other tourist information, use the Praslin Island trip site . Fly from Luxor to Praslin Island in 13.5 hours. Alternatively, you can do a combination of taxi and flight; or do a combination of bus and flight. The time zone difference when traveling from Luxor to Praslin Island is 2 hours. Traveling from Luxor in April, you will find days in Praslin Island are slightly colder (37°C), and nights are a bit warmer (30°C). On the 28th (Sun), wrap the sightseeing up by early afternoon so you can travel back home. Your day-by-day itinerary now includes Robben Island Museum as well as Table Mountain National Park. On the 29th (Mon), step off the mainland to explore Robben Island Museum, then take in nature's colorful creations at Kirstenbosch National Botanical Garden, then admire all the interesting features of Victoria & Alfred Waterfront, and finally examine the collection at District Six Museum. Keep things going the next day: enjoy the sand and surf at Boulders Beach, take some stellar pictures from Cape of Good Hope, and then examine the collection at Great Synagogue. To see where to stay, maps, other places to visit, and more tourist information, read Cape Town trip maker . Fly from Praslin Island to Cape Town in 10.5 hours. Traveling from Praslin Island to Cape Town, you'll gain 2 hours due to the time zone difference. Traveling from Praslin Island in April, expect nights in Cape Town to be colder, around 14°C, while days are a bit cooler, around 28°C. On the 1st (Wed), wrap the sightseeing up by early afternoon so you can travel back home.